When I read The Book Thief over the summer last year, I was in awe. I couldn't get this amazing story out of my head. It truly affected me. 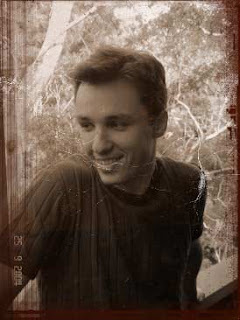 I'd like to introduce you to Markus Zusak, author of The Book Thief. I hope you like him as much as I do. When I was growing up, I wanted to be a house painter like my father, but I was always screwing up when I went to work with him. I had a talent for knocking over paint and painting myself into corners. I also realized fairly quickly that painting bored me. When I was a teenager, I read some books that brought me totally into their worlds. One was The Old Man and the Sea and another was What’s Eating Gilbert Grape. When I read those books, I thought, ‘That’s what I want to do.’ It took seven years to get published and there were countless daily failures, but I’m glad those failures and rejections happened. They made me realise that what I was writing just wasn’t good enough – so I made myself improve. Do you follow a set routine when you write? I basically have two routines. The first one is the non-lazy routine, where I get up and work from about 7am and aim to finish by 11:30. That usually sees me through till noon or twelve-thirty (with some time-wasting in between). Then I’ll take a long break and do a few more hours in the afternoon. The lazy routine usually starts at 10am and I’ll write longer into the afternoon. The only time these routines really change is at the start or end of a book, when I’m more likely to work at night. I can’t face starting a book early in the morning purely because self-belief levels are at their lowest for me when I wake up. When I’m finishing a book, I will stay up longer and work through the night, mainly out of desperation to finally get it done. What was your inspiration for writing The Book Thief? One day, there was a terrible noise coming from the main street of town, and when she ran to see it, she saw that Jewish people were being marched to Dachau, the concentration camp. At the back of the line, there was an old man, totally emaciated, who couldn't keep up. When a teenage boy saw this, he ran inside and brought the man a piece of bread. The man fell to his knees and kissed the boy's ankles and thanked him . . . Soon, a soldier noticed and walked over. He tore the bread from the man's hands and whipped him for taking it. Then he chased the boy and whipped him for giving him the bread in the first place. In one moment, there was great kindness and great cruelty, and I saw it as the perfect story of how humans are. When I remembered those stories, I wanted to build them into a small book, like I said. The result was The Book Thief, and it came to mean much more to me than I could have imagined. No matter what anyone ever says about that book, whether good or bad, I know it was the best I could do, and I don't think a writer can ask for more of himself than that. What do you do to get away from writing? Living in Sydney, I’ve taken the chance to start surfing again. One of my best memories of growing up is catching my first proper wave and surfing across it and my brother cheering at me from the shore. Many years later, I’ve started up again and I’m really loving it – as long as the waves are small enough…I also watch a lot of movies, especially when I’m struggling with a story I’m working on. I like watching the same ones over and over again, so I half watch and half think about the story. Lastly, where do you get your ideas from? I started writing when I was sixteen. I’m thirty now. I get my ideas from fourteen years of thinking about it. I hope you'll read The Book Thief. It's one of my top 10 books of all time. The Book Thief is definitely in my top ten as well. He has a new one coming out called Building the Bridge, or something like that, it's about a bridge, just look it up on goodreads. I can't wait to read that one! Great interview! I have the Book Thief sitting in my TBR right now - definitely need to get to it soon! I'll have to add it to my Must Read list!